March 30, 2015 at 7:40 am Add a comment! While it’s true that we don’t come into embodiment with a book of instructions, I wish we did at least show up knowing how to breathe. Many of us breathe much too shallowly which keeps the body tight. Relaxation is difficult and body functions have a tendency to be stagnant. This makes all the little mundane things we do everyday much harder. In the ideal situation, a person breathes slowly, deeply, consciously. you maintain a sense of well-being. When you breathe properly, you exercise your intuitive skills. Many people mistakenly believe they are not intuitive when, in fact, they are. The problem is they are breathing so shallowly that their body is too uptight to know when the intuitive sense is working. If you feel you aren’t breathing properly, take yoga classes. Find a yoga teacher who will admit that s/he can teach proper breathing techniques. Take some breathing classes from a breath instructor if you can. That’ll only make you a better reflexology practitioner or client-partner. Singing classes may be an option for you as well. Set aside 2-3 minutes a day in which you simply breathe mindfully. To do this, begin by sitting comfortable in a quiet, safe place. Focus on your breathing. It may help to close your eyes here for a couple of minutes. Find a place on your body where you can actually feel yourself breathing. That may be your nose, your abdomen or your diaphragm. Now – just pay attention to your own breathing and nothing else. Notice the quality of each breath, how your body moves, how it feels to breathe. As you do this, you should begin to feel some burdens lifting and some stress melting. Try doing this exercise daily for several weeks. This may be something you find yourself doing daily over a long period of time. Or, this may be something that eventually becomes a meditative exercise for you. In the meantime, try to spend a few minutes each day consciously breathing in through your nose and out through your mouth. As you do this, be aware of your abdominal muscles contracting as you inhale. As you exhale through your mouth, feel your abdomen softening, expanding. When this happens, you may not be getting enough carbon dioxide in your blood or not enough oxygen to your brain. Notice your own breathing each day and observe how your client-partners breathe. Encourage better breathing habits for both you and your client-partners. Guideline: Breathe slowly, deeply, consciously. Thank you for reading this blog/book. I hope you will enjoy this next series of posts which make up the wellness part of the textbook. March 25, 2015 at 5:24 am Add a comment! WHEN YOU COMMIT TO making health a priority, it becomes a part of your everyday life. This commitment is one thing everyone needs. You become conscious of how your physical, mental, emotional, and spiritual systems work together and how they change daily. You listen to the messages your body sends. 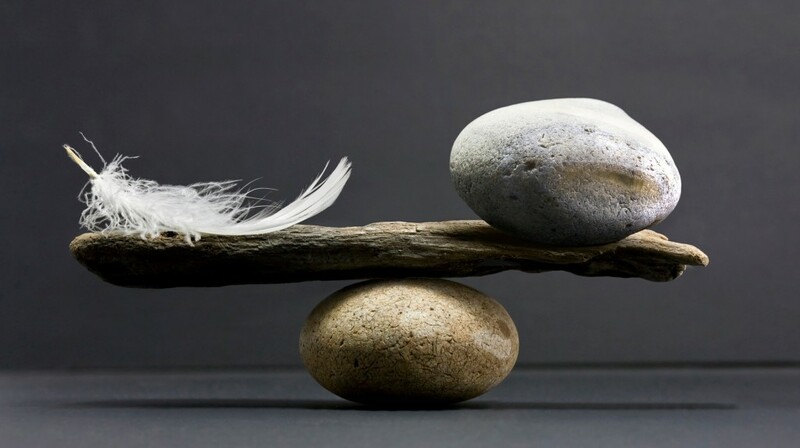 WHEN YOU REALIZE THAT something is not right, you work to bring about balance. Homeostasis offers an opportunity to honor the body as a complex system. Homeostasis occurs when this system is in balance. This is the one thing everyone needs. WHEN YOU FOCUS ON your overall health as the pieces fit together and make sense. with the importance of homeostasis. for my money we can’t have good health without homeostasis. the advice of professional healthcare professionals. The important thing is to take control of the body and the future of our health. Taking control means being well informed about our options. We have to know the difference between what options are “good” and what options are “not so good”. The power to choose a path based on practical information is strong. The informed choices we make guide us down the path to health. Curing disease starts with preventing it. and what we consider to be important. Hopefully you’ll find things that will work for both you and your client-partners. At the end of this section of the book, both you and your client partners should be empowered by the information shared. This is the one thing everyone needs. Thank you for joining me in this journey as we explore homeostasis and health. I hope you found this helpful. Please leave your comments below and check out the other posts. Why do they come to our tables? Homeostasis! March 22, 2015 at 2:42 pm Add a comment! Why do they come to our tables? People visit a reflexologist searching for wellness and healing. Many have never thought about being in in control of their bodies and their health. Of course not, in today’s world everyone has so little time. No one has time to learn and absorb concepts about healing…especially when information overload is a way of life for us all. a spiritual message sent on a subtle wave length. But, whatever the message, they make an appointment. Reflexology for the Spirit offers homeostasis. When a person embraces this concept, life changes. Healing becomes a priority. Wellness is a journey. The person begins to heal on all levels. The reflexology table is the hub of a wheel of growth. Marge D’Urso taught us a reflexologist needs to know much more than just where the points are. THIS NEXT SERIES OF POSTS WILL ASSIST YOU, THE REFLEXOLOGIST, in your journey as you guide and assist your client partners on the path to wellness and healing: homeostasis. THIS NEXT SERIES OF POSTS WILL ASSIST YOU, THE CLIENT PARTNER, on your path to wellness and healing: homeostasis. This path is a process, not a pill. Give homeostasis an opportunity to occur. When this happens, the process can be felt on several levels. General relaxation throughout the body occurs when a person receives Reflexology for the Spirit regularly. This feeling is so rare in some that it takes several sessions before the client-partner even understands what the feeling is. Over time, as different healing habits become a lifestyle, the body begins to heal itself. This concept can be new for a person embracing homeostasis….especially when a person begins sessions thinking there is no control over health at all. and learn about many other health benefits. The feet themselves will begin to improve. Finally, an improved sense of emotional well being takes place. The result is an increased awareness of one’s body and how it feels when healing occurs. You, the reflexologist, have an opportunity to profoundly influence health, longevity, and well-being as you inspire and guide your client partners. Jennette Nearhood provided the artwork. March 18, 2015 at 7:12 am Add a comment! Envision balance and wellness, homeostasis, or whatever you want. After including reflexology in your life, the most important thing you can do to bring about homeostasis is to become aware of the path you are now on..
what we’re going to do when we arrive. . This may seem like a subject that doesn’t belong in a reflexology text book, but it really does. If you’re going to help people get to a better place health wise, they need to know where they are going. Not everyone knows about setting goals. As you teach them goal setting they’ll envision the balance and wellness which is best for themselves and their health. And, you, likewise will benefit from setting your own goals. Learning the importance of how to envision balance and wellness is a good start. Sometimes, client partners come to a reflexologist, massage therapist, or whomever. After a few visits they begin to feel better and forget why they came in the beginning. Then they stop coming. Without lecturing, teach them that energy follows intent. Your client partners need to see Reflexology for the Spirit as a process, not a pill. Keep them (and yourself) focused on what you find as you reflex their feet. You do this when you learn, gently, what is happening in their lives and their visits to other healthcare professionals. Review, periodically, how their feet have changed, and how these changes affect their health in general as they envision balance and wellness. When you can get the answer to that question, you’ll both be on the way to balance and wellness (homeostasis) through a health goal. Many of your client partners may have multiple issues. Each individual is unique. But, homeostasis is a goal that all can seek. When this happens, the body is in a good health balance. Disease is a sign that the flow toward homeostasis has reversed. So, the red flag words become markers teaching how far away from homeostasis the body has drifted. You, as the Reflexology for the Spirit practitioner, are concerned with a person as a whole. You work to create a natural balance that is wellness oriented. You seek to expand the positive potential for good health in all areas. Disease prevention is the best medicine. March 16, 2015 at 6:59 am Add a comment! 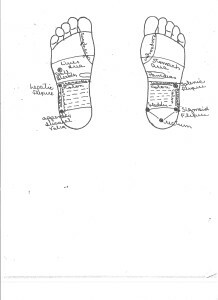 Reflexology wouldn’t be what it is today without the many charts created by reflexologists over the years. The charts are, to my mind, all accurate and all wonderful. They vary greatly depending on the abilities, skills, and experience of the reflexologist creating them. When I say this, I mean not only the skills, abilities, and experience of the reflexologist but also the skills, abilities, and experience of the reflexologist as an artist. Several years ago, I found the work of WhiteHawk. She is not only an accomplished reflexologist but also a wonderful artist. She has a website that shows a few of her gorgeous paintings. WhiteHawk has a chart. I contacted her and received permission to share this chart with you. As you study it, you’ll notice a few points that are exclusively “WhiteHawk points.” These points are hers alone, as far as my research reveals. These points represent healing places which WhiteHawk has successfully explored in her career. When you examine/study a new chart for the first time, please take note of any special points. Use them on your client-partners. See how they work for you. Special points on WhiteHawk’s chart include the jaw, hernia point, Ha-Ku point, and shoulder tension. The WhiteHawk Ha-Ku point is important. It is found on some hand points but never on feet. The Ha-Ku point can also be found on some ear points. I’ve used this point and find that it works in my practice. And, of course, WhiteHawk’s shoulder tension point can become very important in your practice. I don’t know how it is for your practice, but my client partners have a lot of shoulder tension. Please refer this article to your preferred social media. 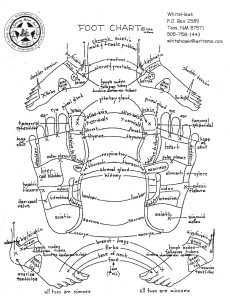 Reflexology chart shared by WhiteHawk. March 11, 2015 at 6:25 am Add a comment! The thyroid is a small endocrine gland found at the base of the neck. The spirituality of the thyroid, a challenging issue, is evident because it’s an endocrine gland. The thyroid functions as the “gas pedal” of our bodies, facilitating energy and strength. More women than men suffer with thyroid issues. They’re difficult to diagnose. The tests are not accurate enough to properly find a mildly troubled thyroid. For some, an untreated thyroid issue is very difficult to live with. 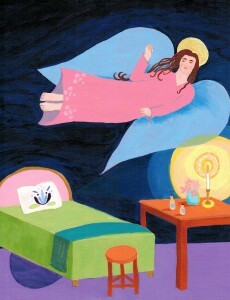 Menopausal women ask spiritual questions as their lives move into a new phase. The spirituality of the thyroid, a challenging issue is “front and center” here. An underactive thyroid causes depression, weight gain, low energy, hair loss, dry skin, mental dullness, and sleep disorders. People suffering with thyroid issues seek balance, courage, energy, mental alertness, vitality. Sometimes an under active thyroid takes what seems like forever to diagnose. If you have thyroid issues and cannot find a solution, don’t give up. A persistent professional healthcare provider can get you to the foundation of the spirituality of the thyroid issue. You can also try meditation to help cope with the issues of the spirituality of the thyroid. The following short meditation may help you. It’s seeks the wisdom of Mother Mary. She helped me tremendously in my journey for a solution to my thyroid problems. Find a quiet place where you are safe and will not be disturbed. Sit quietly and allow Mary, Queen of Angels, to come to you. When you feel her presence, open your eyes, ears, and heart. Her teachings offer compassion, courage, and vitality. At first, you may feel nothing. However, after a few sessions, you will feel Mary’s presence in some way. She will answer your questions around universal truths. It’s not necessary to be a Catholic to receive Mary’s teachings. It’s not even necessary to be a Christian. Nor is it necessary to believe in God. Mary’s compassion is open to all. Mary, Queen of Angels, is an icon of wholeness. We can all seek Mary’s truths when the challenges of the spirituality of the thyroid seem to be overwhelming. Sit with Mary for short periods several times a week as you seek her wisdom and insight. Michele Garner donated the artwork in this post. March 9, 2015 at 7:17 am Add a comment! When a person isn’t receiving needed nutrients either on the physical, mental, emotional, or spiritual level, cravings exist for the hidden needs. If there is no craving, there is often a need to reject those hidden needs. Lost appetites happen when it’s time to withdraw or retreat inside oneself. Accumulated stress is a good example of this phenomenon. Accumulated stress can cause either food cravings or appetite loss. Digestive problems are caused as much by worry and stress as by food. The stomach is not generally shy about letting the rest of the body know about any problems it experiences. When this happens, issues can surface within minutes after the body recognizes the problems on any level. What feelings, energies, experiences, memories, are you holding in your stomach? Are they causing pain, nausea, discomfort, general digestive malfunction? Sit comfortably in a quiet place. Turn on some quiet music and breathe from your abdomen for 1-2 minutes. Now, begin to focus on your stomach. Ask your stomach how it feels. RELEASE attack, control, despair, fear, pain, stress, worry. CLEAR OUT all negative memories, experiences, feelings. EMBRACE calm, focus, well-being, positive outlook. Experiencing this release, clearing, and embrace for 1-2 minutes. Now, begin to move your body slowly as you end the meditation. Repeat this short meditation whenever you experience stomach upset. I hope you found this post helpful. Please leave your comments below and check out other articles. March 6, 2015 at 9:53 am Add a comment! It reacts to complications from infections and diseases in other parts of the body as it filters out impurities and toxins in the lymph fluid. The spirituality of the spleen goes hand-in-hand with its purpose and tasks as it maintains wellness in the body. The spleen filters and recycles blood cells as it maintains the blood volume in the circulatory system. It also participates in the digestive process because it enlarges as we digest our food. When there is spiritual stress, the spleen can suffer. People with splenic issues need to receive help from the universe. Focus on strength, confidence, and courage. The spirituality of the spleen really depends on this. Learning to stay present for healing and transformation can be a powerful experience. Find a quiet, secure place and get comfortable. Breathe to encourage grounding. Breathe in from the abdomen and then release negativity from your life as you exhale. Breathe in and breathe out for a minute or 2 until you feel grounded. Ask the universe to release the negativity from your spleen as well as from your life in general. Now, focus on receiving positive attributes needed for you to heal and attract the resources you need to succeed. Talk to your spleen. Encourage it to heal and regenerate . Now, listen to your inner self as it offers wisdom for your journey toward health and well-being: homeostasis. Begin to breathe the grounding breaths again while repeating the word “peace” several times. I hope you found this helpful. Please leave your comments below and check out other posts. March 4, 2015 at 6:45 am Add a comment! The operative word here is RESPONSIBILITY. The important thing here is to not neglect yourself in the midst of carrying the weight of the world. When you are neglecting your own needs, your own activity may be hindered. When you experience discomfort or malfunction in your shoulders, stop and ask yourself how you can make changes in your activities and lifestyle which will release blockages which cause pain and stiffness. Are you hugging the wrong people? Do you need fun in your life? Take a few moments out of each day for yourself and your shoulders. Try to focus on solutions instead of problems. Seek out guided meditations which allow you to breathe deeply and release your worries. Encourage yourself to relax completely for a few minutes each and every day. Find a safe place. Turn on some quiet music, get comfortable and breathe deeply from your abdomen. Encourage your shoulders to heal as you send energy to them. Guide the energy from your heart to your shoulders and down your arms and hands to the tips of your fingers. Open your diaphragm. I hope you found this post helpful. Please leave your comments below and check out other posts. Michele Garner provided the artwork in today’s post.